How sure are we that Russian Kettlebell - 18 lbs. (8kg) will work for you? 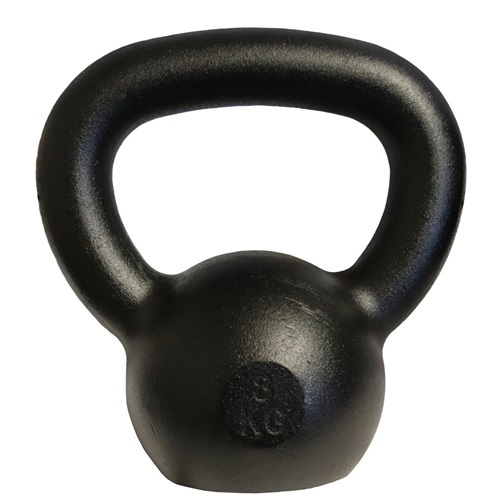 Simply fill out the form below and put Russian Kettlebell - 18 lbs. (8kg) to work for you right now. Obviously, we would go out of business if Russian Kettlebell - 18 lbs. (8kg) didn't work, the way we said, right? 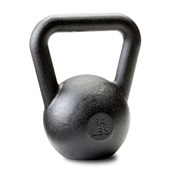 With the promise of a full refund if you're unsatisfied, you have nothing to lose by trying Russian Kettlebell - 18 lbs. (8kg). Go ahead and try it today. 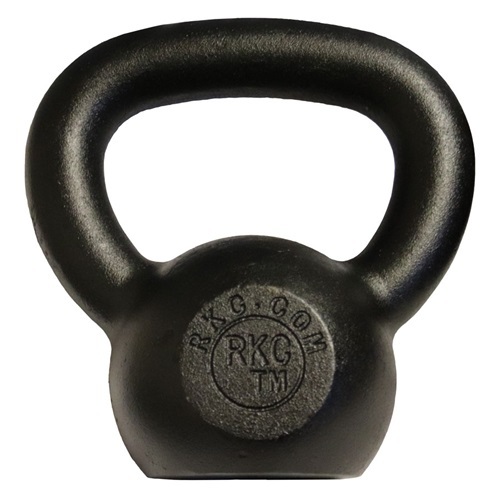 Dragon Door’s 18 lbs RKC kettlebell is uniquely suited to women's exercise needs. The 18 lbs kettlebell remains our most popular "beginners' kettlebell" for those women eager to start shedding those extra pounds, gain energy and new confidence—when all else has failed. I am very pleased with the 18 lb kettlebell. It allows me to do exercises (like the Turkish getup) that I can't do with the heavier kettlebells yet. My wife has started to do some basic exercises too. Perfect weight for her. After looking at all of the kettlebells available in stores and online, I chose DragonDoor and am happy I did. I immediately saw and felt the difference as soon as I opened the box, which was packed very well for shipping. I know these will last a lifetime. I am a trainer at a local gym and I've been using my 18 lb. kettlebells for quite some time now with clients and they love them. I introduced them first with the swings and we are currently working on more technical lifts such as snatches and one arm ladder presses. One of my female clients, who only weighs around 115lbs, started with the 18lb and now she currently able to perform consistant confident swings with the 35lb. bell. I've noticed stronger thrusts and squats from my clients due to the fact that the hip flexors are brutally targeted during most kettlebell routines. It's evident that these kettlebell workouts have brought the best out of my clients. Rated 10/10 YES!! I got my wife training with Russian Kettlebells! I got this kettlebell for my wife who is being trained by Yoana Snideman, RKC. It is a good starting size for much of what she is doing and it's light enough so she is not at all intimidated --she's age 48, 5'1", about 115 lbs. (She also uses my 12, 16 and 20kg for other exercises, and I used this 8kg for Turkish Get-ups when nursing a slight muscle strain.) These KB's are magic. I have a ruptured lumbar disc (partially-healed)and have been training with KB's as rehab for 14 months. No dieting, meds or other exercise really -- just KB's, and my weight is down 4%, cholesteral count down 10%, strength way up! Russian Kettlebells are Truly THE MOST EFFECTIVE and EFFICIENT exercise tool I have encountered in my 49 years! Oh yeah, I can't wait until my wife can crank off some tactical pull-ups! The prior version was rubber coated with a smaller handle and cost more. I tried it at a class. I am glad this new version has the fatter handle, it is perfect for guy's doing press-ups (the 25 and 35 pounders are a little too heavy for me right now). Oh yeah, this version is cheaper. Ladies shouldn't worry about the handle, it is still manageable for smaller hands for swings etc. 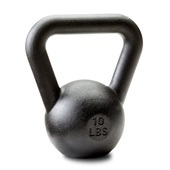 BTW, I made a mistake and ordered some "non-Dragon Door" kettlebells from another company thinking I'd save some $$$. You'd think all kettlebells would be the same, these are "low tech" after all. But instead of saving money, I lost money, the handle grips are too narrow to help me build grip strength (no better than dumbbells) and the handles on the "competitor's" version form a square instead of a rounded "v" which means 1. they aren't as comfortable to grip and 2. you can't grip them with "palms up" for squats. So it is possible to take a seemingly simple product and still screw it up. 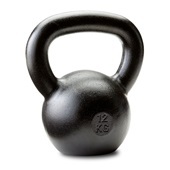 Rated 10/10 The 8 Kg Kettlebell helped me keep the faith when I was injured. Tendonosis, a lump in my achilles tendon developed as I was just a few months into learning to workout with my 12 Kg KB. The orthopod said- no ballistics, running, jumping. the PT looked at the dragondoor website and said- "Don't do that, you could rupture." As much as I love Pilates, it could not replace the power and strength I had developed learning to box squat and swing. I had ordered the 8 KG to teach myself snatches and do windmills. It arrived the same day my doctor sent me home in a big boot on my ankle to prevent accidental rupture of my achilles tendon when walking around. Thank goodness my boyfriend has almost all of Pavel's DVD's! He created a mini workout that kept me off my foot but kept me in the game. The 8 Kg-er is nothing to scoff at. Even if you are usually working with heavier KB's it is a wonderful tool to hone your skills, whether you use it on its own, or with another KB. When my back pain flares up, I can do sumo deadlifts with both Kettlebells to rebalance my hip strength or sidearms to keep my shoulders strong and stretched. Even if I never move up to any KB heavier than 12 Kg, the 8 Kg KB has helped me keep the faith in my practice when I would have killed myself with a heavier weight! 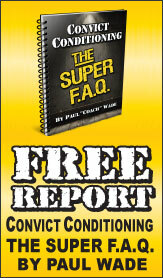 I bought one for my girl friend, who loves it, and I use it to train fitness beginners. A great tool. I ordered both an 8 kg and a 12 kg. The 12 is staring at me every day while I work out. They are the best quality and I wouldn't buy them anywhere else. I started with a 4 kg bell and have been working my way up. I have decided to skip the 10 kg. and go to the 12 next. This is the only system that I have been able to stick with. I am nearly half-way through a 45 kg weight loss plan. I love this KB, I call it "the baby" since it's the smallest one I have. The finish is very nice. I added a dinosaur sticker on the flat side to suit my aesthetic sense. The best thing is my 4 year old daughter loves to lift it off the floor (about 2 inches) and then shows me her muscles! 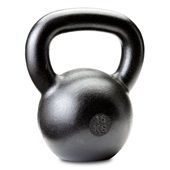 I think the 8kg bell is a great size for someone who is just getting into kettlebells and maybe minor experience with weights. I recently had a baby and had been out of practice with weights. I was comfortable using the 8kg bell exclusively for Turkish Gettups and Snatches. For swings, I could probably use a 12 kg, but have stuck with the 8 kg to get my strength back up. For my situation, I think the 8kg was a great choice. I might add a 12 kg later, but I think the 8kg will always have a place in my reps. The quality of these bells are the best out there.